Registration essential: Please click here to register This is a free event however advance bookings are recommended. Kimberley Visions is a five-year landmark study mapping the rock art and occupational history of the Northern Kimberley. It examines shared art styles across northern Australia and questions of regionalism and identity. Did similar styles occur between the Kimberley and Arnhem Land? What are our current understandings about shared traditions and why might they have changed through time? In this lecture Professor Veth will profile advances in regional mapping, style analyses, dating and occupational histories from excavations. The 5-year research project is funded by the Kimberley Foundation Australia and the Australian Research Council. Rock art as living tradition is realised through a research collaboration with Balanggarra Aboriginal Corporation and their Healthy Country Plan. 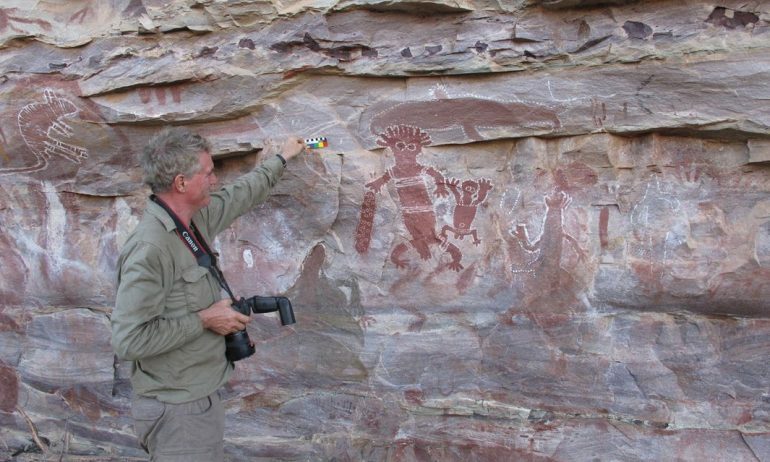 The rock art of the Kimberley is renowned for the insights it offers into the deep history of Aboriginal social practice, depicting people, their belief systems and environments in great detail. The elaborate compositions, depictions of personal ornaments and scenes of group dynamism provide windows into millennia of cultural practices. Professor Veth, Kimberley Foundation Ian Potter Chair in Rock Art at University of WA, has carried out research on archaeology, rock art and its cultural significance from North-west Australia for 30 years. His major research areas have included the Dampier Archipelago, Western Desert, Kimberley and Island SE Asia. He is a Fellow of the Australian Academy of the Humanities and in 2014 was awarded the Rhys Jones Medal for outstanding contributions to Australian archaeology.